Latvia in the United States of Europe? What do the parties, taking part in the 13th elections of the Saeima on October 6, 2018 think of the future of the EU, and Latvia’s place in it? 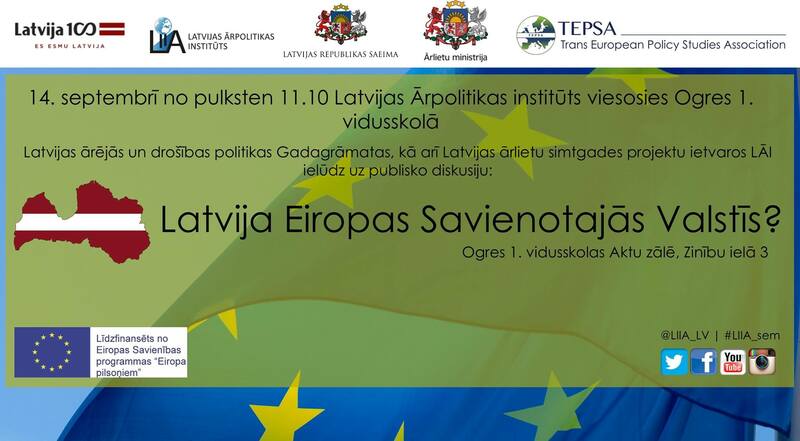 This and other issues will be addressed on September 14, when the Latvian Institute of International Affairs will hold a public discussion: “Latvia in a Federal Europe?” in the Ogre 1st High School, Ogre city. The discussion is organized in the context of two books of the Latvian Institute of International Affairs: the Latvian Foreign and Security Policy Yearbook, as well as The Centenary of Latvia’s Foreign Affairs. Both projects are supported by the Saeima of the Republic of Latvia and the Ministry of Foreign Affairs of the Republic of Latvia. The event is organized in cooperation with the Trans European Political Studies Association (TEPSA). The debate is supported by the EU’s Europe for Citizens program. Regional discussions in previous years were organized in Daugavpils, Liepaja, Cēsis, Jelgava, Rezekne, Ventspils, Cesis, Bauska and Jurmala. After the discussion there is a coffee break.